Perfume bottles and scarves – my two loves go together well, showing you how well, is the aim of this post. The first scarf of my collection that I present today is called Quadrige. It is an old design, first brought out in 1976 by Pierre Peron. In 2012 Hermès used the design for a limited edition of their 24 Faubourg Eau de Parfum, which I just had to have. I love the perfume still, albeit from afar as wearing it is just too much for my lungs these days, but its beauty is just as great for the eye as it is for the nose. A quadrige, or quadriga, is an ancient four-horse, two-wheel chariot usually used for racing. By analogy, “quadriga” also refers to a sculpture representing a quadriga. Famous quadriga sculptures include those at the Grand Palais in Paris, the Brandenburg Gate in Berlin and the one on the Parthenon frieze at the Acropolis Museum. A new version of a scarf from the 70s, “Quadrige” is an exercise in style that plays on interweaving four horse heads and harnesses, like the pieces of a puzzle. 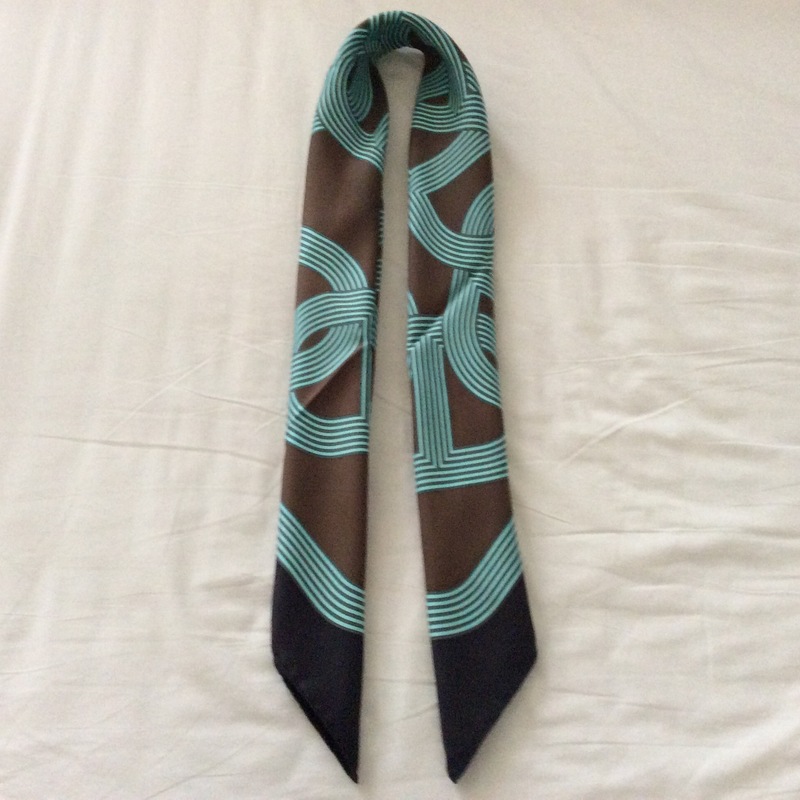 Its extremely stylised pattern, graphic look with large full-tone areas, uninterrupted line outlining the horses’ manes, and braided cords around the edge all come together to give the scarf a very fashionable seventies feel. Design by Pierre Péron. 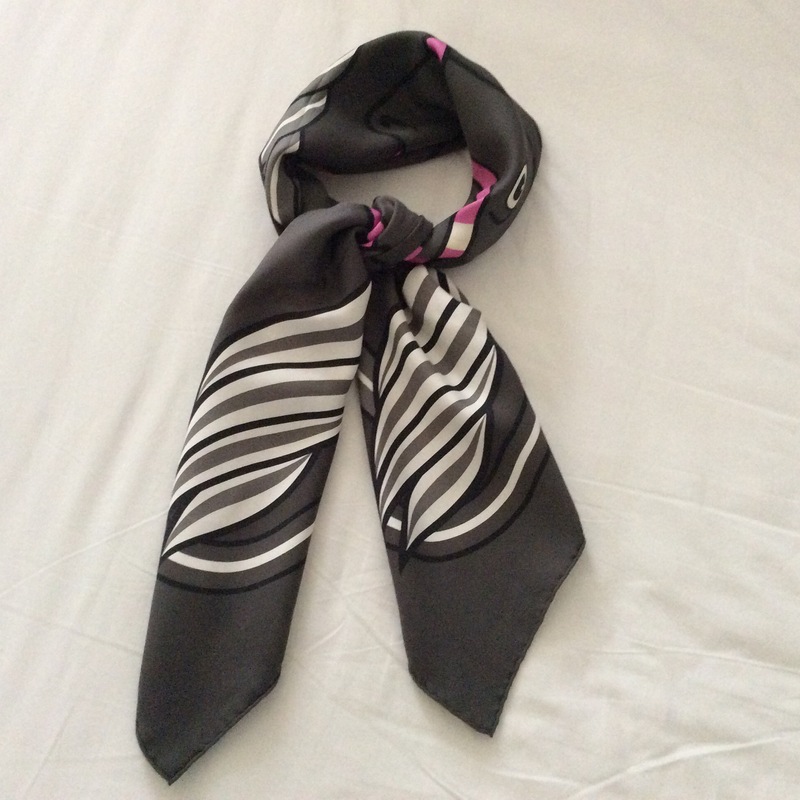 I got my Quadrige scarf second hand from ebay and was overjoyed when I found it in this particular colourway, neutral greys, black and white with a pop of pink. It was a good deal and though not in perfect condition, I almost relish the fact that this is a workhorse (pun intended) scarf that I can wear without restraint, without worries of staining or damaging it. I just enjoy it. It is one of my most worn scarves. The second scarf this week may seem familiar, as I have already shown you its little sister in this post. Here I included the small pochette in the same design, so you can see the difference in size. I bought this scarf in 2012 right when it came out because I fell for it hook, line and sinker. It is perfect. The colours, the lines, the clean geometric forms, its dynamic curves and the fact that it looks entirely different when worn than when seen in its entirety. It is always a good idea to post a pictue of our lovely Portia, and thankfully today I have good reason. When I first met Portia, I was wearing Circuit 24 Faubourg along with a fur collar (from Mai Tai Collection). Completely unrelated but by popular demand and as an addendum to last week’s post, here is a shot of me wearing De la Mer au Ciel in a simple cowboy knot, with the knot tucked under. Do you know and wear 24 Faubourg? What do you think of limited edition bottles? Frustrating or tantalizing? 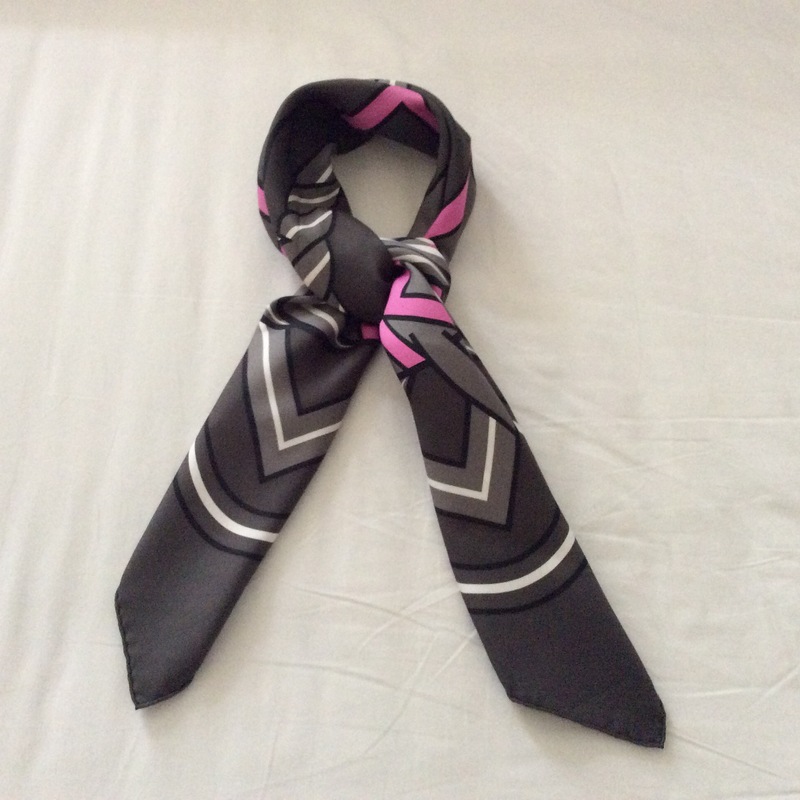 This entry was posted in Hermès, Scarf Collection and tagged 24 Faubourg, Hermes, scarf collection, scarves, silk. Bookmark the permalink. It seems that like with perfume, you end up wearing the more simple, less precious ones in your collection the most. I love that pic of you (looking like a movie star) with Portia and the reminder of that funny comment is too good. Thanks for the great neck shot. They do make a big difference. That is a very astute observation, Tara, I do tend to wear the simpler designs more in perfumes AND with scarves, I hadn’t realized that. These bottles are gorgeous!!! Well worth seeking them out. Yes, the pli de bas or bias fold in English, is the start of most knots. Oh, B, you do look lovely in each of the photos! The one with you and Portia has always been a favorite, and now I learn that the scarf and the mink collar are two different pieces. I do wear 24 Faubourg, although I always seem to forget about it as it’s in my dark cupboard to keep it fresh, which is a shame as it is such a great scent. My bottle is just the run-of-the-mill one – I may need to hunt for that extrait version. With your asthma, can you sneak whiffs of fragrances that you cannot wear, or does that trigger an episode as well? Such a shame…but the scarves are another wonderful way to demonstrate your personality and joy for beauty. Woo Hoo! I made the picture gallery. You are so beautiful Birgit, and stylish. The big chain scarf has colours I wear all the time so I like it the best today, green and aqua on brown are so divine and then they finish it with black! Heaven. That was such a fun night. Happy, happy memories. 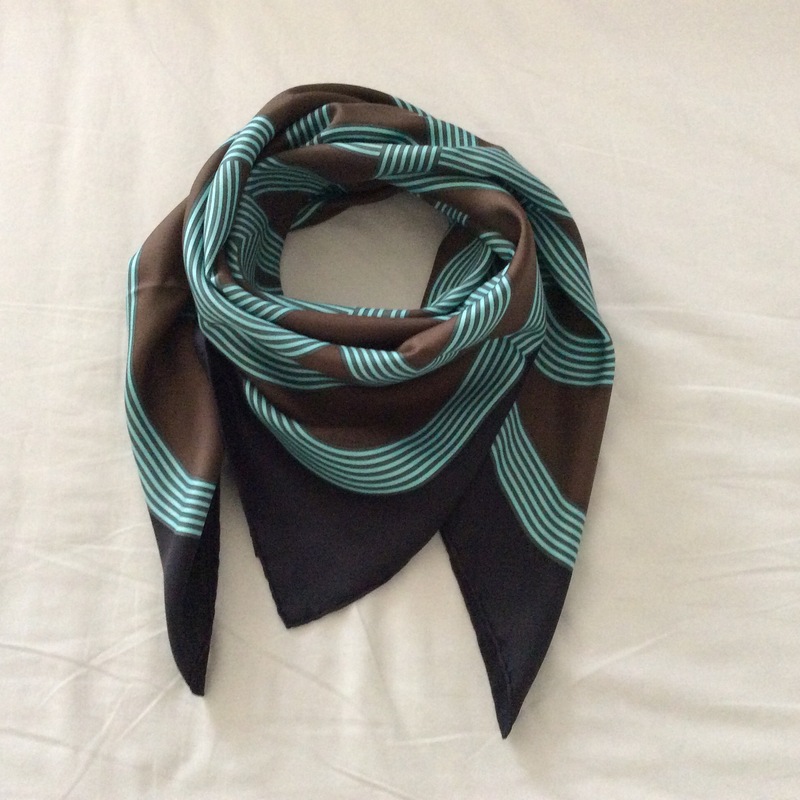 The colours on the Circuit scarf are really fabulous, such an unusual combination. Happy to hear you like it as well. 🙂 Congrats on your beautiful scarf! What a nice pop of pink on that very classic design. Happy weekend to you too, dear happyface! I don’t wear my 24 Faubourg either, but somehow it is enough to have the bottle as a work of art to just look at and enjoy. Oh wow, the snowflake bottle must be wonderful! Serge Lutens does amazing limited edition bottles as well. 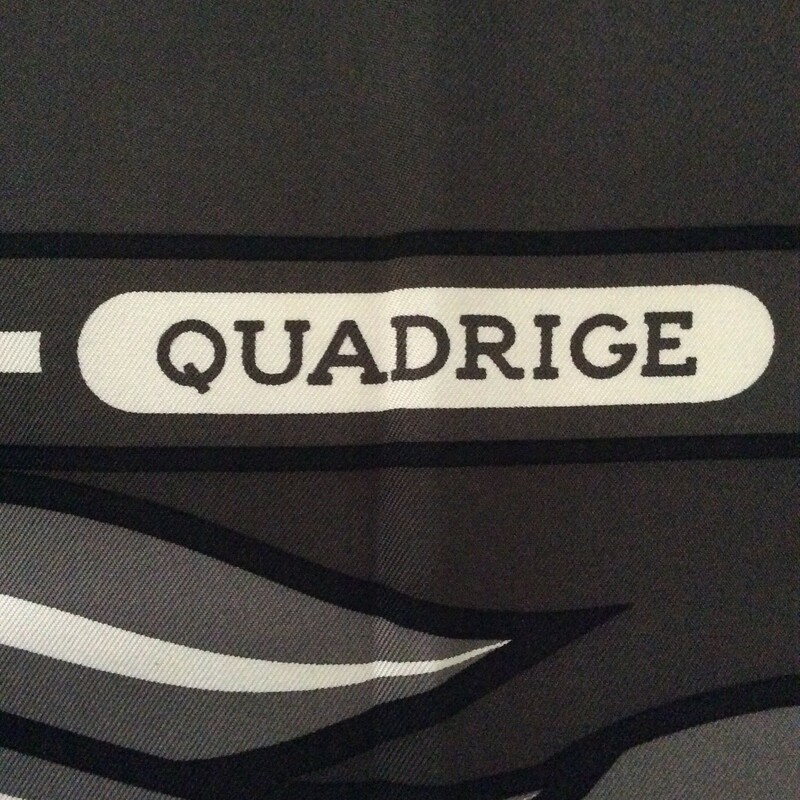 I love the Quadrige. The horses look surprised-lol. 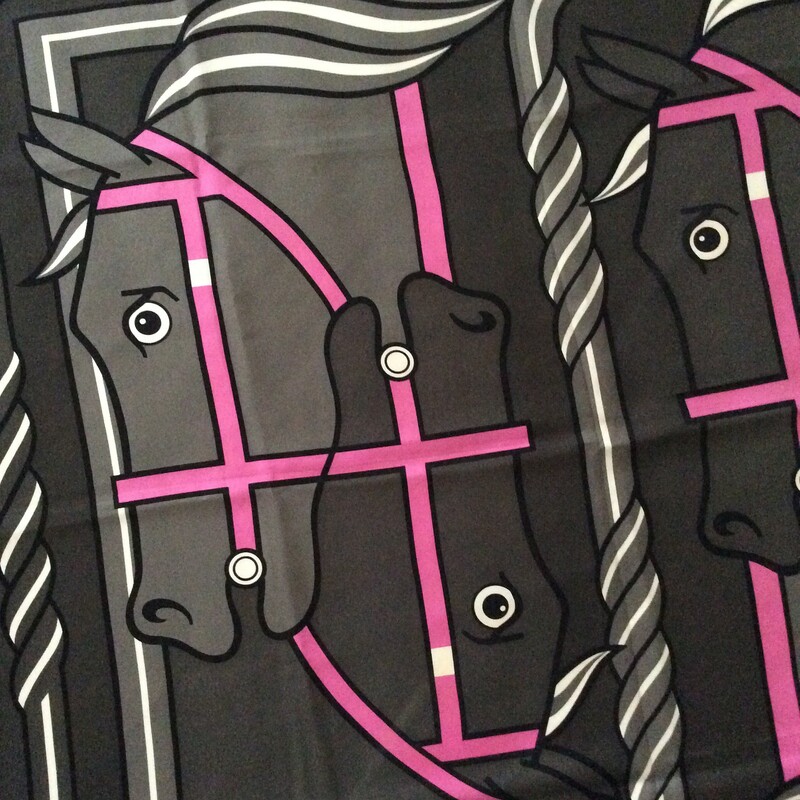 I would love a Hermes scarf with horse saddles and bridles on it. I’m sure there is more than one Hermes scarf like that. Hi Birgit, beautiful perfume bottles of this most grown-up of scents. I have almost finished my 100ml bottle of Faubourg and I very much enjoyed it. For me though, it is missing the ‘quirkiness’ and individuality I love from my favourite scents. it is very much a ‘professional’ smell, though beautiful all the same, therefore there are other FB purchases I have my eye on before I will re-buy Faubourg. Your scarves are amazing and you really do show them off so well! You look almost regal in the top picture with Portia ( and I love the collar of the coat). Most grown-up of scents is a really good description of 24 Faubourg. Hum. Faubourg 24 — for my nose it is also too much. The smell and composition themselves I think it is a pure old lady stuff. And with its potency, it is a perfume to mark the territory, even before you enter the room. it will enter and will then stay there for hours after you have left. So if for your surroundings you are wrong with it, you will be remebered twice: for a bad smell and for its persistence…But I really wish I liked it, as I adore the bottles — the special editions are even better. For scarfs, ok I have been alreay saying a bit on that here.. But out of those above, the circuit has the best color palette. The thing is, maybe your own colar is fully in accordance with industry standards and foxes live happily and healthy all the time etc, the issue is that if in 6 month 20 other fashionista-parfumista, who read your blog, start to search for such colars, they might not buy them from happy farms, but from the places like at this photo. If each of them is seen by another dozen of other fashionista, who also begin to demand their colars, all over the world — believe me there will be a bunch of producers exploiting in the worst possible way animals in reply to the increased demand. I just would like to say that one should be responsible for ideas that one propagates, with what we wear or what we eat etc. To assure, myself I am not even a vegetarian, though I buy meat from bio producers, and all my shoes are from real leather, as my bags, but I would never ever buy a piece of fur and especially would never try to induce anyone with my own example or else to demand for furs. You may of course delete this post, if it is too painful, but life may become a tiny bit better if you use your blog and readers to reduce the cruelty. Ah, snobbycactus, I can only imagine that you really enjoy being the voice of dissent here and that you love a little controversy. I will not go into a fur discussion here, but I appreciate your point of view. 😉 A diplomatic answer. I indeed happen to write here only once I have a serious objection. I am reading many posts here, but either I have no opinion for not having ever tried that given perfume or I agreed with what is written and so have nothing to add…. Please give OT readers a bit more credit and the owner of this blog a lot more respect. Otherwise there are plenty of other blogs out there to read that are no doubt more to your liking. Thank you, Johano! Happy Weekend! We all agree that blogs nowadays shape trends in real life and one blog can impact twenty others which in turn will impact hundreds of people on the street. With what those will want to wear and to consume. As a blogger you do not control who will be reading you and the impact it will have. If in some months thousands of chinese fashion lovers will search for fur collars to combine with their hermes scarfs (be those faked or not), well most likely they will buy them from their local producers of fur collars. I really advice you to watch this http://www.unleashed.org.au/videos/?video=fur-farms (or just use google image to search for “fur factories in china”). If after having seen this you can still happily discuss on how cool it is to wear fur collar with a hermes scarf (or without it, hermes is not the point), then just forget this post… Cheers, I didn’t want to be mean and I quite like your, Tara, posts on perfumes. I was very glad to hear that you were going to write about Hermès scarves and am looking forward to each of your Friday posts. What a timely post for me: I just bought a Coffret Nomade with Kelly Calèche and 24 Faubourg. I have wore the latter for days in a row and every whiff of it (and given it’s lasting power, there were quite a few) makes me want to smile and straighten my back. I feel elegant and confident wearing it and do so throughout the day. I find the limited edition bottles gorgeous, but prefer the 15ml bottles in their beautiful orange pouch fir how easy they are to carry around. And both scarves are on my list now ;-). Thank you very much for this and all your other posts! I’m so happy to hear you are enjoying your new perfume so much! If it makes you feel elegant and happy it fulfills its purpose. Birgit, Hermes 24 Faubourg edp is one of my most treasured perfumes. It is a big scent, but my skin somehow tames and brings it down to size, such that it is one of the most-complimented perfumes I’ve ever worn, and it is so joyful to me. The Hermes scarves that you show here capture that same feeling. And I love both of those pictures of you: the one with Portia shows that scarf’s elegance (as well as your own, not to mention it being a wonderful memento of your friendship) and the latter photo shows the creamy pearlescence of my favorite scarf from your last post. I know this is a favorite of yours, which is why I thought of you often when I put this post together. I enjoy 24 Faubourg very much although mostly in cooler temps since it’s such a rich perfume. I also continue to love your Friday scarf blogs and enjoy learning more about each one in your collection. 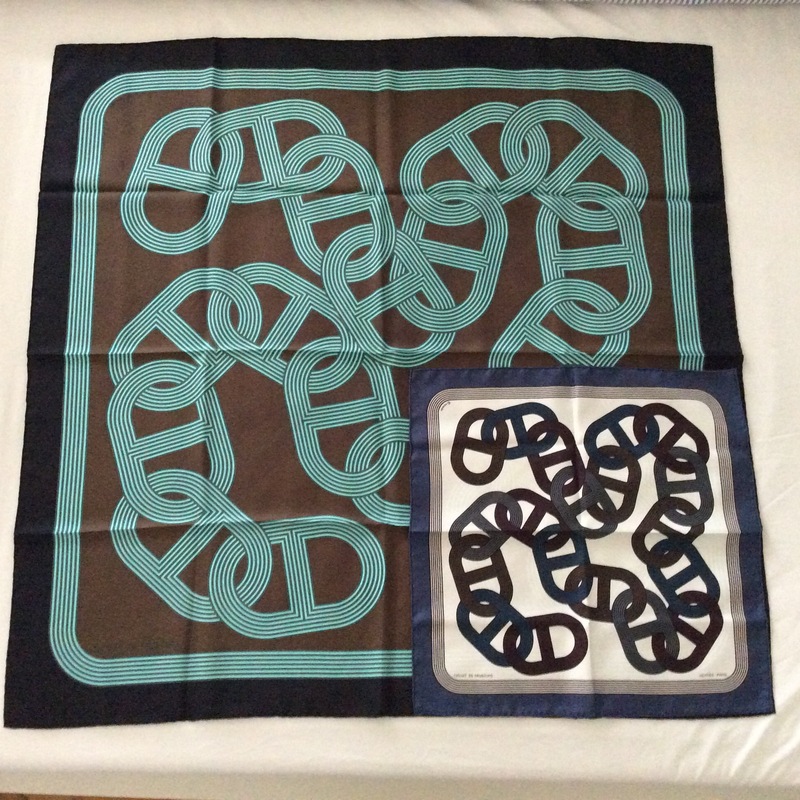 Have you thought about doing a post on how to tell an authentic Hermes scarf? I would be afraid to buy one off EBay or at an antique shop because I wouldn’t know what to look for. It would be great to have some pointers. Thanks for sharing another of your lovely scarves. Yes,I second the suggestion for how to spot an authentic Hermès scarf! I can try to do such a post, although I am not a real expert… at least I can point out the things I do know. That would be a great help. Thanks so much! Yes, please. I’d like that, too! I wear 24 Faubourg less and less. I have to say I agree with Annette, above, that it is a very ‘professional’ scent, and although beautiful, to me lacks a little character. I’m sad I feel this way because I own a darling little 30 ml bottle of the EDP which I searched hard to find at a good price. It spends most of its time in its orange box. I was thinking just today that what I should do is get it out and wear it much more often, even though I don’t care for it so much, to add some good memories to it and make it my own. The Circuit 24 Faubourg design translates beautifully on to the bottle. I hope you find one! 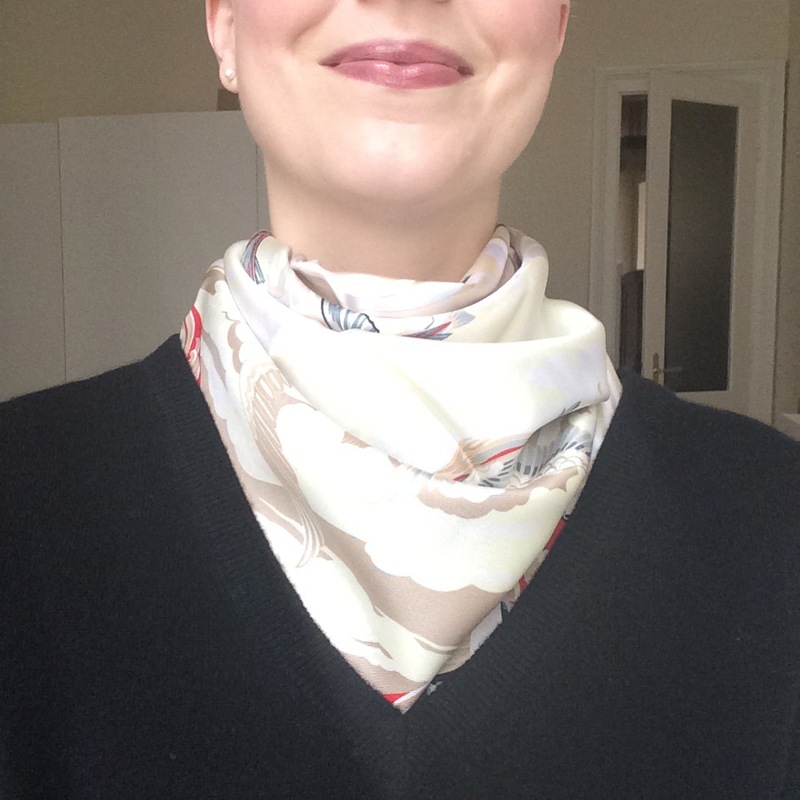 So happy you are still enjoying the scarf posts and wearing yours. Hermes seems to have added a third size (at least for the American market). The bangles now come in sizes of 62, 65, and 70. Perhaps the 62 size would work for you. Tres tres chic Birgit! 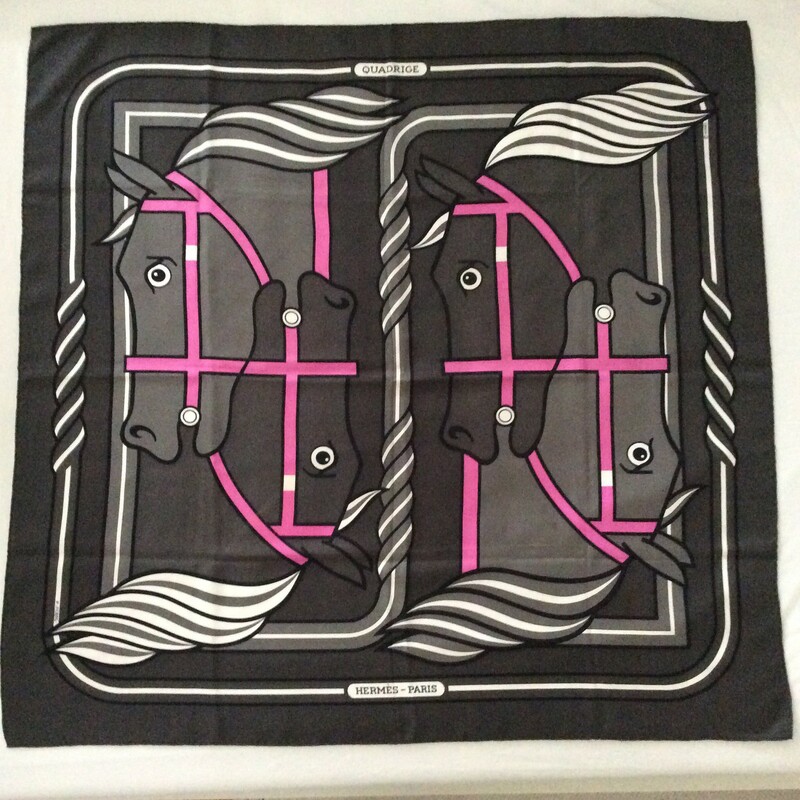 am also enjoying this Hermes scarve’s serie. Am learning so much and can’t wait to get pointers on how to spot an authentic Hermes scarve. 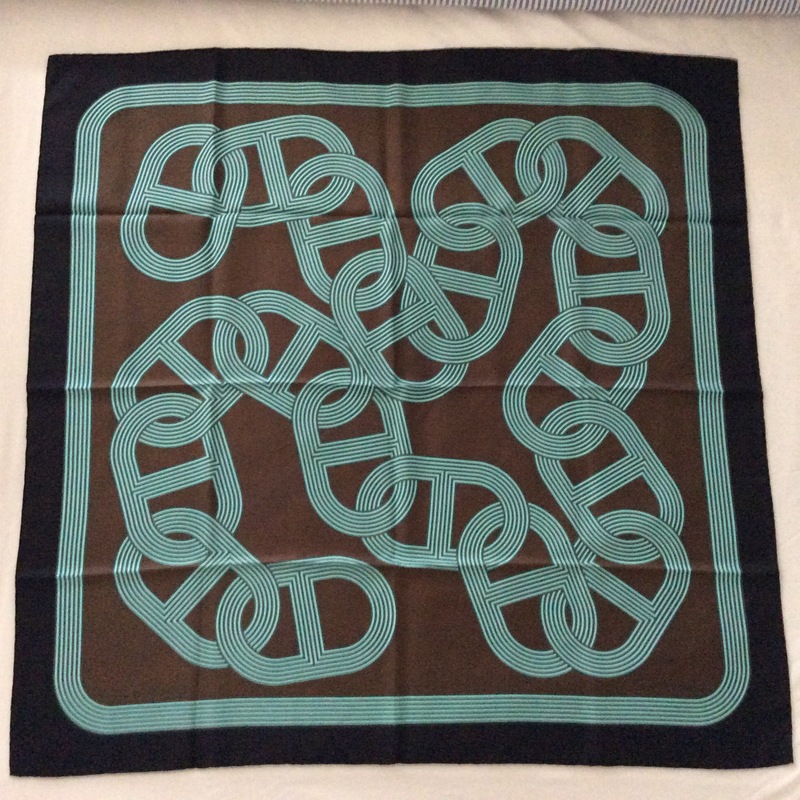 I’m really thinking of saving my pennies, so I can purchase a scarf from Hermes someday! I love Mai Tai’s blog with all her scarf tying tutorials and all the lovely products she makes available. If I lived someplace really cold, I’d contemplate splurging on one of the fur collars, but some how it’s just too much for California. I’m glad you enjoy 24 Faubourg so much, dear Tatiana. The LE bottles make it een more special, they pop up now and then on ebay, hopefully you find a good deal eventually. MaiTai is such an elegant and inspiring woman, isn’t she?